An earthquake rocked Seattle and caused all sorts of problems at Grey Sloan Memorial Hospital on Grey's Anatomy Season 11 Episode 15. I've experienced tornados and hurricanes, but have yet to fall victim to an earthquake. One thing's for sure, though, Mother Nature always strikes and loves to wreak havoc. Meredith's surgery came to a halt as the building shook like crazy. After 89 successful surgeries, her long streak was threatened and yet she still seemingly was able to save another life. That's right – Meredith hasn't lost a patient since November 14, which just happens to be the day that Derek left. I liked that Meredith admitted that her kids were happy and her career was soaring, but none of that meant anything without Derek. She called to tell him that they were on a streak, and I naively believed that we would finally hear McDreamy on the other line. It's just been too long! I should have known better, though. Of course an unfamiliar female voice was on the other line. Seriously?! No one has time for unnecessary drama. Derek better not be messing around. Meanwhile, Maggie found herself stuck in an elevator with a flirty radiologist. She's so awkward, and I'm glad that she ended up saying yes to Ethan. I know we just met Ethan but there's something about him with Maggie that makes me want to see more. Elsewhere, Owen received a phone call from a child, who was worried about his mother's safety. Owen worked with Amelia and Richard to give medical advice to the young girl over the phone in hopes of saving her mother's life. 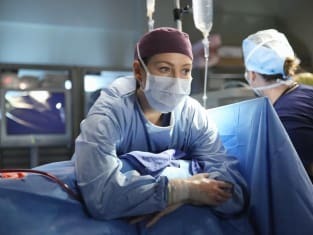 I wish I could say that I enjoyed this storyline, but I found it hard to believe that the hospital didn't need all hands on deck on such a hectic day. Did all three of the doctors really need to be on the phone? I did like the scenes between Owen and Ruby. They reminded me of how Owen once wanted to be a father, and I can't wait until that day actually happens for him. It was nice to see April and Jackson back at the hospital. Ben joined the "plastics posse" with Jackson and realized that he needed to be there for his sister. Kudos for showing Ben had a change of heart and for also apologizing to Bailey. Do you think Derek could actually be cheating? I just don't see it happening, but hope we get answers next week. Please don't drag this out. Omelia hugged it out and did much more in the on-call room. Are you rooting for these two yet? I liked Callie and Maggie's scenes together this week. They were fun and lighthearted, and that seems to be something that's been lacking lately on Grey's Anatomy. Be sure to return next week to chime in on our Grey's Anatomy Round Table. What did you think of "I Feel the Earth Move"? I thought the installment was fair and am disappointed with the way it ended. As a major MerDer fan, I don't care for more drama in their marriage. Overall, the episode just didn't stand out to me. 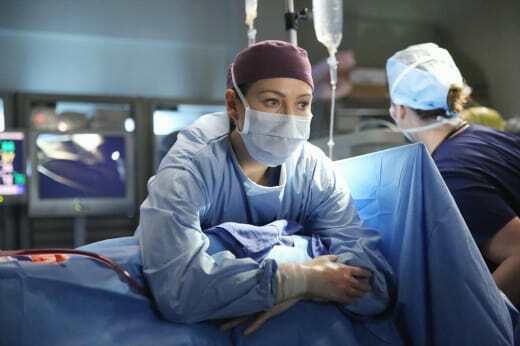 NOTE: Grey's Anatomy Season 11 Episode 16 will be titled "Don't Dream It's Over" and air on Thursday, March 19. Jackson: You might get an invite from me to join the plastics posse. Ben: You think that sounds cool? Jackson: I did not at first, but it grows on you. Permalink: I did not at first, but it grows on you. Life's too short to be scared. So, screw the gap. Let Ethan razz your berries, goose your gander, tickle your tail feathers, cup your coconuts, rock your rump, poke your hontas, wallop your wonderland! Grey's Anatomy Round Table: Is Derek Cheating?! ?